The race for NBA Rookie of the Year just got a little bit chippy between consensus picks Ben Simmons and Donovan Mitchell. Mitchell, the electric guard who has propelled the Utah Jazz to a playoff berth, gave his own silent statement on the issue Tuesday night before the Jazz took on the defending champion Golden State Warriors. The sweatshirt reads: "Rookie (rook-ee). noun III. An athlete, playing his or her first season, as a member of a professional sports team." Is that supposed to be a swipe at Simmons? Mitchell initially said he doesn't care about being Rookie of the Year. It looks like he changed his mind. The apparent feud, if that's the correct definition, took a competitive turn after the Sixers sensation told ESPN he thought he was unquestionably the most deserving candidate for the award. 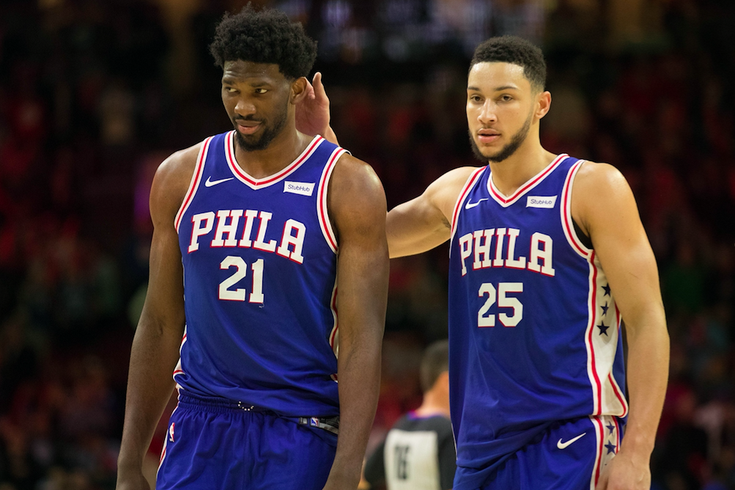 Simmons, who has been a triple-double machine for the Sixers this year, is technically a rookie because he missed the entirety of last season due to injury. Critics, of course, say the year of preparation Simmons got by traveling with the team gives him an unfair edge over the experience of other rookies. They also claim that Simmons could have played late last season, but the Sixers held him out in service of The Process. Jazz were a 17-28 team at one point. Just remember that. He's the ROY. No disrespect to Simmons but he had a year of NBA preparation and development as well as mental preparation sitting, training, rehabilitating in a NBA setting. Love the guy, but realistically he's not a rookie. I dont care what the rules say. An entire year with a pro team staff, trainers, facilities, meetings and teammates. Things that Donovan Mitchell and others didn't have. Other NBA observers and fans took issue with Simmons' willingness to comment on individual accolades at all, even though he was directly asked about it in a dedicated interview segment. Simmons said he isn't paying attention to any of the other ROY-contenders because he's focused on reaching the level of NBA greats like LeBron James, Stephen Curry, Kevin Durant and other superstars. Our own Sixers beat writer Kyle Neubeck published a detailed statistical comparison between Simmons and Mitchell. He decisively concluded that Simmons is in a class of his own. In the court of public opinion, the sweatshirt wasn't exactly a revelation (by definition, it makes Simmons a rookie) or a sign of the humility some have been ascribing to Mitchell. Donovan Mitchell vs. Ben Simmons is the beef we never knew we needed. I think Ben Simmons and Donovan Mitchell should be co-rookie of the year honestly. Jason Kidd and Grant Hill were co-rookie of the year in 1995, and that's the only time two players have won the award. Donovan Mitchell going to be talking about this rookie of the year snub for years meanwhile Ben Simmons gonna be in MVP conversations for the 5th year in a row. This will definitely be one of the most anticipated Rookie of the Year decisions in a while. How much does it actually matter? Probably about as much as Michael Carter-Williams winning it.